A sawed-off shotgun also called a sawn-off shotgun ) and a short-barreled shotgun (SBS) (U.S. legislative terminology), is a type of shotgun with a shorter gun barrel—typically under 18 inches—and often a shortened or absent stock. Despite the colloquial term, barrels do not, strictly speaking, have to be shortened with a saw. Barrels can be manufactured at shorter lengths as an alternative to traditional, longer barrels. This makes them easier to transport due to their smaller profile and lighter weight. The design also makes the weapon easy to maneuver in cramped spaces, a feature sought by military close quarters combat units, law enforcement SWAT team users, and home defense purposes. 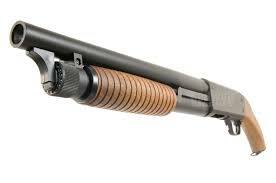 Magazine capacity of pump action/magazine tube shotguns is limited by the shorter length of the gun.